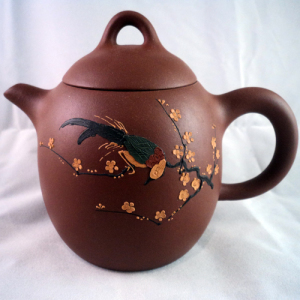 Yixing teapots are prized by tea drinkers for their porous nature. Every session enhances the taste as the unglazed clay slowly absorbs the tea. After years of regular use, Yixing teapots develop a special shine from the inside out. They aren’t very common in the U.S. but savvy tea lovers spotted these beauties in The Blind Banker episode of the popular BBC series Sherlock. Dating back to the 15th century, they can only be made with special purple clay from the mountains surrounding Yixing, China. They are usually much smaller in size than western pots, enabling the tea drinker to achieve smaller brews with concentrated flavor and aroma. The color of the clay can range from dark purple to reddish brown and even pale green. Traditional styles are usually understated and plain but you can find modern pots made to look like pumpkins or cute animals, too. 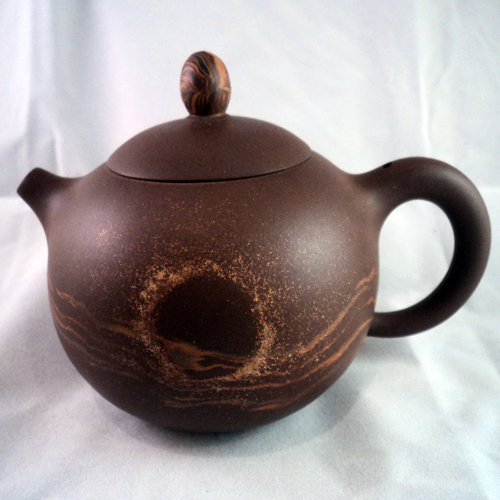 Black tea, oolong and pu-erh all perform well when brewed in Yixing teapots. White, yellow or green teas do not tend to work well as the clay retains too much heat. This increases the chances of making your tea bitter. Due to their absorbent qualities, Yixing teapots are usually dedicated to a single type of tea. For example, I have different pots for sheng pu-erh, phoenix oolongs and greener rolled oolongs. Mixing teas that are very different from each other could result in a muddled flavor. Maintaining your pot properly will give you years of enjoyment. In order to prevent mold, after each use leave the lid off until the inside has dried completely. It’s also important to never wash your Yixing with soap or put it in the dishwasher. The clay would absorb the chemicals, ruining any tea that you try to make in the future. I’m often asked when someone should make the leap to using an Yixing. My answer is always to wait until you find a tea that you love enough to dedicate a teapot’s entire lifetime to it. There is a wide range of quality and price levels in the market today. It’s best to purchase from a trusted retailer who specializes in Chinese tea ware. A good starter pot could be found for as little as $50 while higher end handmade pieces will cost thousands. Be wary of antiques as there a lot of counterfeits. If it sounds too good to be true, it generally is. Much like cast iron skillets, Yixing teapots require seasoning. There are many different methods to do so but this is the way that has worked best for me. Fill the pot with room temperature water and let it sit for about 4 hours. Empty the pot and fill it with boiling water. Let it sit until the water cools to room temperature. Dump out the water and place tea leaves into the pot. Fill with boiling water and let it sit until it cools to room temperature. Repeat the previous step with the same leaves, allowing it to cool to room temperature again. Remove both the water and leaves. Your pot is now ready to be enjoyed! Feature image by Brent. It’s been cropped from the original. – Usage license – CC BY 2.0. Yixing Teapot images by Nicole Martin.